There are very few companies that are able to successfully bring new, profitable products to market. Companies that are able to achieve this – and do so on a regular basis – are usually the ones that end up on the “most innovative” lists we see on Forbes, Fortune, and the like. 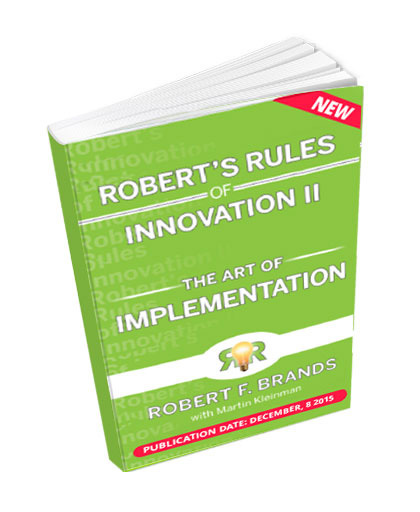 Offering a road map that can improve a company’s likelihood of creating successful and recurring innovation is the best business book on innovation, Robert’s Rules of Innovation II: the Art of Implementation by Robert Brands. On Friday, February 5th, Brands answered 5 questions about his new book in an interview with CustomerThink. The interview answers important questions about the book, gives advice for CEOs and one of the top drivers of business performance. CustomerThink is a global online community of business leaders striving to create profitable customer-centric enterprises. The site serves 80,000+ visitors per month from 200 countries. Main areas of coverage include Customer Relationship Management, Customer Experience Management and Social Business. This is the place to learn about every facet of customer-centric business management in articles, blogs, interviews, and news. CustomerThink’s mission is to help business leaders develop and implement customer-centric business strategies by publishing high-quality articles, blogs and discussion; conducting research on key issues and trends; and by facilitating interactions with a global panel of experts.